Please urgently call and fax the Swedish Embassies and/or consulate offices in your country to demand a halt to the deportation of Mohammad Mehdi Maleki. Mehdi’s story is here and talking points (reasons why it is illegal to deport him) are presented here in English and German. Abdolali Madadzadeh, father of imprisoned student activist Shabnam Madadzadeh, spoke recently with the international Campaign for Human Rights in Iran about his daughter’s transfer from Rajaee Shahr Prison in Karaj, to Gharchak Prison in Varamin, on Tuesday evening without explanation. According to her sentence, Madadzadeh is to spend her prison term in exile at Rajaee Shahr Prison. Abdolali Madadzadeh, whose son Farzad Madadzadeh is also in prison, told the Campaign that he is shocked by the abrupt transfer. “Her mother traveled from Tabriz to Karaj yesterday to visit with her daughter, but she was not allowed to visit her. Authorities told her that they were transferring them to Gharchak Prison, and did not allow a visitation. Since yesterday, we are confused about what this means. This morning Shabnam called us for just one minute to tell me what happened. They allowed her to make a one-minute phone call and let us know,” said Abdolali Madadzadeh. 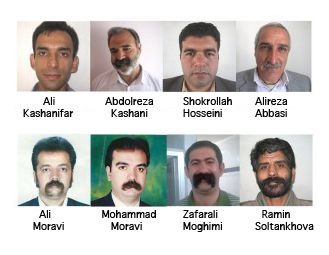 A lawyer close to the case of dervishes from Gonabad described the status of those arrested for the International Campaign for Human Rights in Iran. “On Wednesday, 13 April, eight dervishes by the names of Abdolreza Kashani, Shokrollah Hosseini, Alireza Abbasi, Ali Kashanifar, Mohammad Marvi, Nazarali Marvi, and Zafarali Moghimi, all of whom had been sentenced to five months in prison, 50 lashes, and one year’s exile on charges of ‘disrupting public order through assembly in front of Gonabad Justice Department and Prison,’ were arrested in coordinated and simultaneous operations in the towns of Beydokht, Gonabad, and Ghoochan, and were all transferred to Vakilabad Prison in Mashad,” he told the Campaign. On Mother’s Day last year (May 9, 2010), Iran’s Revolutionary Court announced that five prisoners had been executed: teacher & activist Farzad Kamangar and activists Ali Heidarian, Farhad Vakili, Shirin Alam-Holi, and Mehdi Eslamian. This was, and remains, an immense blow to the activist community and to humankind as a whole. This loss of some of Iran’s brightest stars seemed then – and still now one short year later – an unreality. But hope also remains, in that these inspiring people and their amazing stories, aspirations, and courage reached — and continues to reach — activists and ordinary citizens around the world everyday. Please also urgently copy/paste this or your own version & add your own signature to the webforms for contacting Tobias Billström, Swedish Minister for Migration and Asylum Policya and his Press Secretary Linda Norberg.